Fracture that occurs at the distal end of the femur bone, that includes the femoral condyles and the metaphysis. The femur, also known as the thigh bone, is the longest bone in the body. Distally, the lateral and medial condyles articulates with the Tibial plateau of the Tibia forming the Tibiofemoral joint, and the patellar surface of the femur articulates with the patella, forming the patellofemoral joint. Together these two joints form the knee joint, which is the largest weight bearing joint in the body. 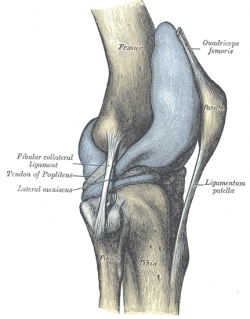 During flexion and extension the patella and Tibia act as one structure in relation to the femur. The knee is a hinge type synovial joint, consisting of ligaments, bones, tendons and cartilage. The two main muscle groups that play a role in knee flexion and extention is the Quadriceps and Hamstrings. Distal femur fractures are mainly caused by high- and low energy types of injuries. High energy fractures: usually occurs in young adults (predominantly 30year old males) and results in intra-articular fractures. Mechanism of injury commonly includes motor vehicle accidents, high velocity missile injuries and/ or a direct blow mechanism. Low energy fractures: mostly occurs in the elderly people, secondary to osteoporosis (predominantly in women over 65years). These fractures most commonly occurs with twisting motions or falls. 4-6% of all femur fractures is distal femur fractures, and more than 85%of these occurrences is low energy fractures in the elderly. Clinical/Physical examination: the typical clinical picture during the inspection of the knee is swelling in the knee region and clear dislocation. Radiographic examination: AP and lateral views of the Femur. The most common classification system used for distal femur fractures is the AO/OTA system. Transarticular approach and retrograde plate osteosynthesis (TARPO). Wound dressings post-op as well as 2days post-op, or as directed by the operating doctor. The main aim of Physiotherapy post distal femur fracture is to get the patient back to his/ her baseline function and to prevent complications. Whilst the patient is admitted in hospital, the Physiotherapist will teach the patient how to mobilise using the correct walking aid, with the correct weight bearing status as discussed with the doctor. Thorough education regarding the condition, management and rehabilitation should be given. Extensive physical therapy will follow surgical fixation and stabilisation of the fracture. Extensive physical therapy will include basic progressive range of motion exercises, teaching of muscle strengthening exercises, circulatory exercises and mobility/ gait training activities. Physiotherapy is indicated from Day 1 post-op. Early mobilisation without any weight bearing limitations have good morbidity and mortality outcomes in the elderly; and also have accelerated functional recovery. ↑ 4.0 4.1 4.2 Ehlinger M, Ducrot G, Adam P, Bonnomet F. Minimally invasive internal fixation of distal femur fractures. Orthopaedics & Traumatology: Surgery & Research, 2017-02-01, Volume 103, Issue 1, Pages S161-S169. ↑ Smith WR, Stoneback JW, Morgan SJ, Stahel PF. Is immediate weight bearing safe for periprosthetic distal femur fractures treated by locked plating?. Patient safety in surgery. 2016. 10:26. ↑ Mohammed S, Hussain MD, Steven K, Daily MD, Frank R, Avilucea MD. Stable fixation and Immediate weight bearing after combined retrograde inter medullary nailing and open reduction internal fixation of noncomminuted distal interprosthetic femur fractures. Journal of Orthopaedic trauma. June 2018. 32(6).